﻿ Isle of Man TT blog: Has the future of the TT changed? Has the future of the TT changed forever after Wednesday’s Supersport debacle? Early morning rain delayed the start of the race and there were still damp patches reported around the course when everyone homed in the revised race start. A decision was taken to run the parade lap with Nicky Hayden, Mick Doohan and co, ahead of the first race (originally it was later in the day) and while this was happening four of the top riders were voicing their concerns over the organisers’ decision to go ahead with a revised 12.30pm race start. John McGuinness, never happy in patchy wet conditions on the TT course (and who can blame him? ), Keith Amor, Bruce Anstey and Guy Martin were all worried about the prospects of being flat out on dry tarmac one second, slithering across a wet patch the next. It doesn’t take much imagination to contemplate the potential for a major accident. He was starting number one and effectively the pace setter, the one with the scary prospect to encounter the wet first. How do you pace yourself for that on a raging 600 supersport that had hard compound tyres with virtually no tread to dissipate the water? The majority of riders obviously felt it was safe to go because there had their race faces on and were focussed on heading off down Bray Hill while McGuiness was still pulling his gloves on. Typically Michael Dunlop and William Dunlop led the charge on the first lap – 1.9s separating them - and when everyone, bar luckless Gary Johnson who pitted with a misfire, flashed past the timing beam on the Glencrutchery Road, we had an interesting race on our hands with Manxman Dan Kneen up to fifth. But then came news that Amor was off at Union Mills – but thankfully okay. That was followed by a red flag just after the leaders had gone through Ballaugh with Michael Dunlop leading William by 10.68s but all the other top men had lost over half a minute! What? Amor’s crash was caused by rain. But his off was just one part of massively dramatic few seconds. McGuinness: “Cameron was leading on the road from Guy and I don’t know how or why, but I could almost smell the change in the air as we hit Union Mills. I thought it might be rain, you can pick up the smell off the wet leaves in the air, and then I saw that little sheen on Cameron’s and Guy’s rear tyres that said rain. “I rolled it, sat the bike up and slowed. As I did that, Cameron did a flying W in front of me and Guy was off the side of his bike. If they’d been on superbikes, they’d have been off. I was already picking where I was going to thread through the wreckage. And that’s what put him, Martin, Amor and McGuinness in such a dangerous position. Changing conditions but still the same flag signals. Clerk of the Course Eddie Nelson didn’t agree. On the face of it, he was the man making decisions but when I asked him why he started the race, against the recommendations of the TT’s leading four competitors, he said: “No one told me that the riders were complaining until after we had red-flagged the race. So how come the Clerk of the Course is not the one making these decisions – and who is ‘race management’ if it’s not him? I can’t answer for that for sure because Nelson didn’t want to be drawn further – but ultimately ACU Events is meant to run the racing while the Isle of Man Government’s job is to promote it. Is the fine line that separates the two merging? I heard gossip that the race day schedules have to accommodate the Subaru rally car demo. It’s absolutely sacrosanct. I know they back the TT with course cars but surely the racing takes precedence ? What’s more worrying is how come Nelson didn’t know about the rider protest? It was only late in the evening that John McGuinness revealed to me that he and the others had taken the matter up with Jim Parker, the Race Director. So don’t these two long-serving ACU officials talk to each other? I put it to Nelson, a massively experienced Clerk of the Course, whether events like today could be averted in future by the implementation of new rule that says, there is no racing on the Mountain course in damp or wet conditions. It’s a good point – but one which McGuinness would argue. It’s easy to harp back to the past and say there was never any question of running races in adverse conditions but in the black and white era bikes like Giacomo Agostini’s 500-3 MV Agusta had probably 80bhp compared to the modern supersport bike with 145bhp. And the corner speed of a modern 600 is actually higher than a superbike! While I understand what Nelson is saying – I also know from what the riders said, once you’ve been through the corner and seen only damp patches, how on earth can you know that the next lap around, 17-18 minutes later - whether it’s the same as before or now standing water? The other big question is why on earth wasn’t the race simply delayed until later in the day when conditions improved? Good point – especially poignant after he had to make public apology for saying the marshals on the Mountain should stop whingeing about the amount of time they were locked in the during practice week. Don’t get me wrong, the TT is not only the most demanding race track in the world, it presents race organisers with some incredibly unique situations that demand tough decisions. Nelson had to make so really difficult calls today – hampered, it seems to me, by some outside forces. But maybe the TT has always been that way. The thing is, when riders stand up and quite rightly say, ‘we don’t think this is safe,’ someone has to take notice because any accident thereafter would really put a lot of people in a difficult position. This is nothing new. 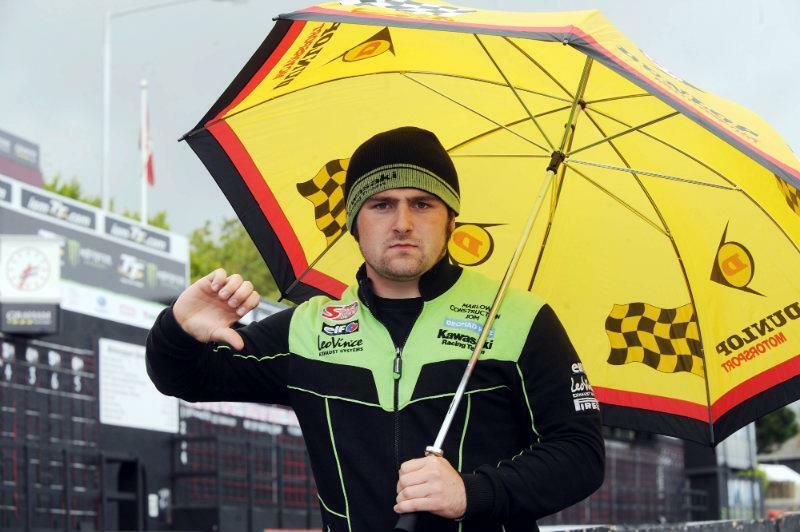 We saw it at the North West 200 a couple weeks back when some leading riders dragged their bikes off the grid claiming the wet conditions made it unsafe but the organisers still gave the depleted grid the green light. The issue there was one of visibility. But it all adds up to the same thing: rider safety. And the more this happens, the more you have to question whether it is actually acceptable to start a race in such conditions. And, if that’s the case, the TT organisers (both race direction and promoters) have to take a serious look at exactly what the ground rules are.